I have been such a bad, bad blogger. 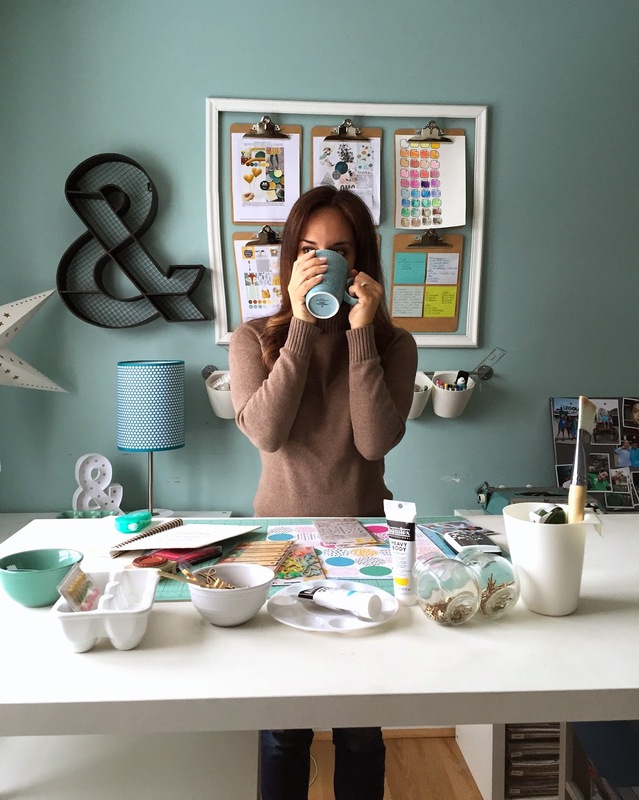 I like blogging, I really do - because I like to talk and it’s kind of like having a conversation with yourself. That doesn’t sound crazy at all. I started instagramming earlier this year and that’s where I post almost every day. But I miss the time capsule that the blog creates, so here I am again. I love going back in time to when Nico was a baby and telling a story. I keep journals so the story is from 2005 although the making occurred in 2015. If I close my eyes, I can remember exactly what he smelled like at this age – heaven. That I miss, the sleep deprivation I wrote about, not so much. Scrapbooking sunny days makes the dark days better right? I remember pulling this photo out and wanting to tell the story of California and all the shopping I did before our trip. A whole new wardrobe of dresses and accessories for my niece and her love of all things sparkly and aqua. I had a really hard time with this design. I wanted to highlight the softness of the ombre pink and floral papers and at the same time give it a bit of ‘edge’. I tried to do that with the triangle up in the left corner. I’m not sure if it really works though. It’s one of those pages I look at and go hmmm?? This photo just makes me laugh. Screaming, mouth wide open – yep, that’s me on a ride. I love that my husband captured this. 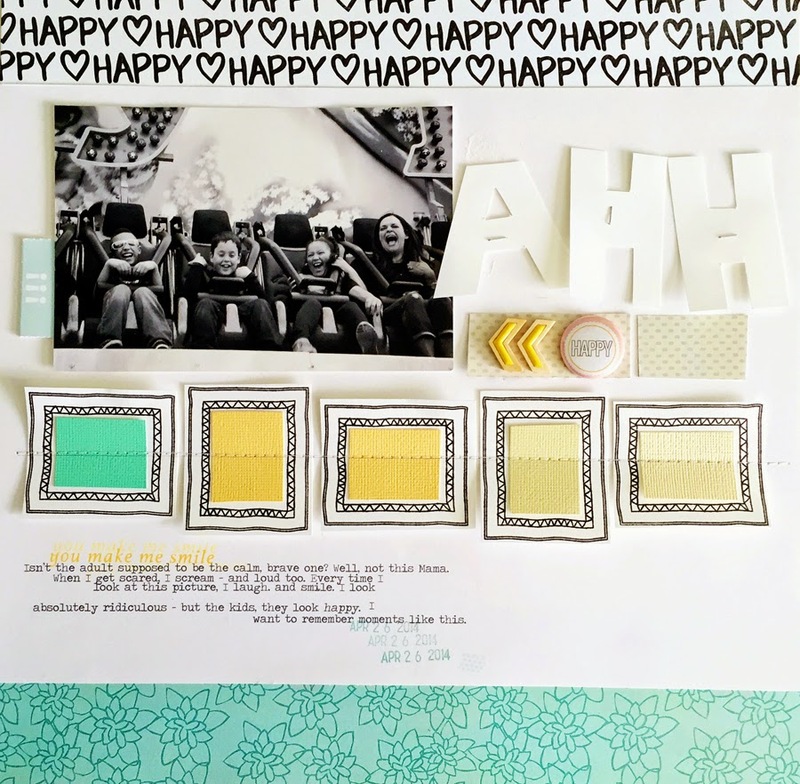 Here I wanted to use the frame stamp and highlight bits of cardstock in shades of yellow and aqua. It doesn’t really tie into the screaming theme, I just wanted to try the technique. I took this apart several times, searching for the balance between not enough and too much. I wanted to highlight the stamping, but not at the cost of the photo. Keeping the title white on white and using a bold black and white print at the top, gives it an interesting yet minimal look. I loved the way this one turned out in the end (even if it took me days to work out). The versatility is what I love most about the Scraptastic Kits. 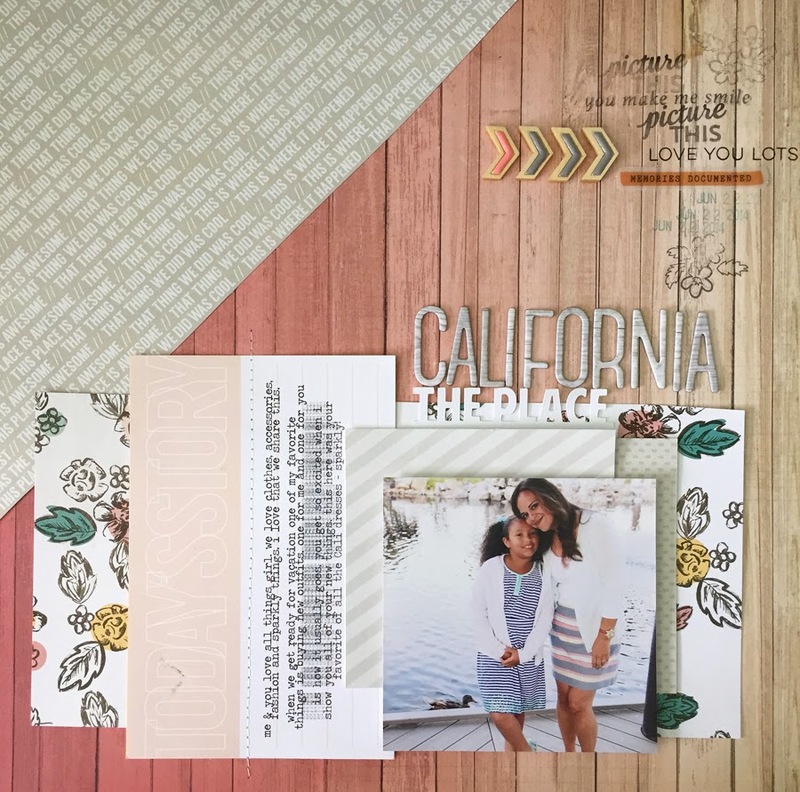 When I can take one box of supplies and create three very different pages (soft, feminine and graphic) – I know I have a winner. Pebbles We Go Together, American Crafts Alpha, Amy Tangerine Thickers. 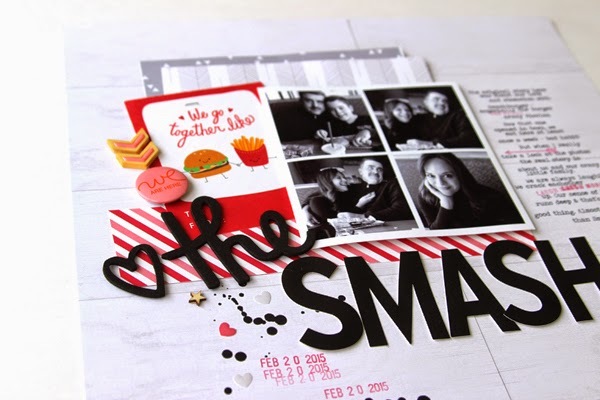 These photos are a series of shots that we took at one of our new favorite places – Smashburger! A French fry was thrown, a kid in a neighboring booth stopped to stare at us and then it just descended into a typical Damiano silly fest. I couldn't stop laughing at the kid's expression. My son (the true product of a scrapbooker Mom) just kept snapping away. So while I started to tell the story of how Smashburger came to town and how much we love it, the photos show who we are. I merged the stories so you get the 'facts' + the personality. Photos that are badly lit (like these) are made so much better by converting to black and white. The 2-inch black American Crafts alphabet was perfect for a bold statement - any alpha this size is going to scream for attention. The placement just under the photos draws the eye as if to say "look here first." Which is exactly what I want! 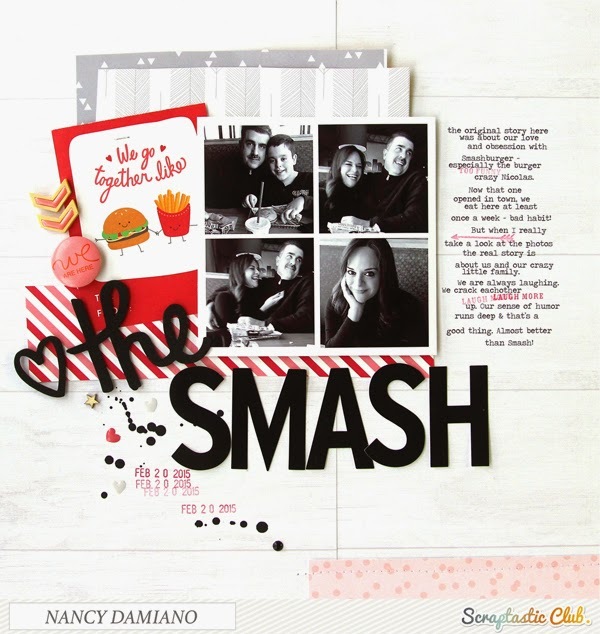 Add random text and shape stamping in a bold color (red here) to a block of journaling text. 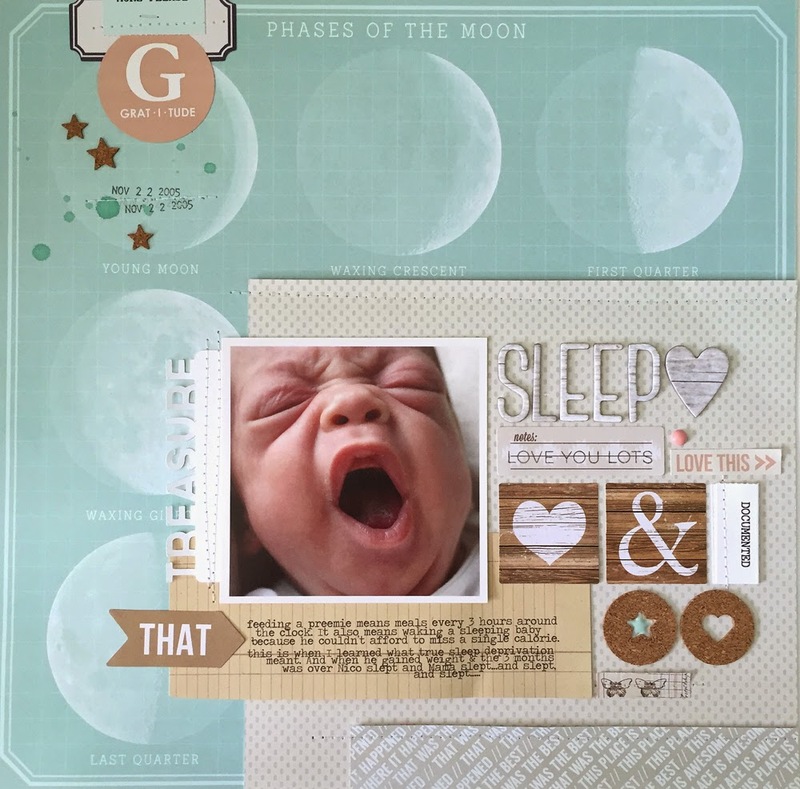 Notice that adding a tiny bit of red in this area creates a visual triangle (from the red date stamp at the bottom, to the red card, and then the red stamping in the journaling). Black and white photos can often handle the weight of a very bold design. Notice how the pictures are still front and center even though there is so much going on here! It's all about connections. The scripty "the" word and puffy heart connect the cheeseburger/fries card to the title visually. The finishing touches of black paint splatters, enamel dots, date stamp and wood veneer connect the script and blocky parts of the title. Notice that from the wood arrows and flair all the way down to the last of the black splatters create a diagonal line of embellishments - that's not random! Connecting the parts is important for creating designs that work.